Nostalgia is fun right? There’s a lot of restaurants I stop at for nostalgia purposes. Taco John’s is a place from our day sin Central Illinois that we don’t have much here…same with Casey’s General Store and Hardees. They’re not the greatest fast food joints in the world but I always get excited when I pass one because I don’t have the option of getting it every day. I didn’t grow up in Michigan so all the empty shells of Hot ‘N Now really never meant much to me. I eventually figured out what they were but I still knew nothing about once thriving regional chain that had 150 stores at it’s peak. 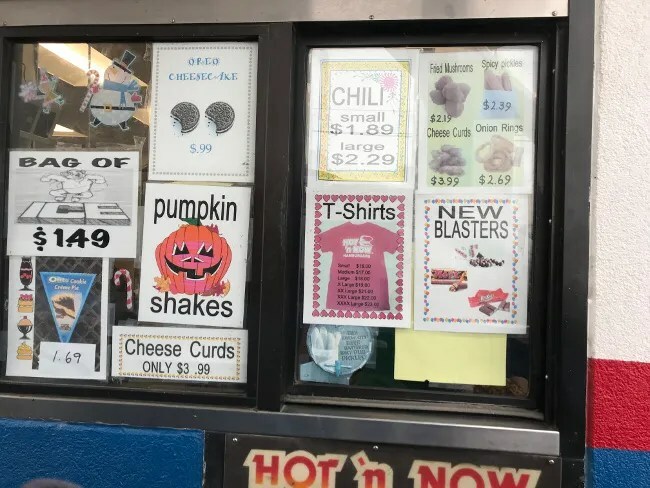 My Michigan-native co-workers have told me stories about the place and how they always wanted to make the drive to Sturgis where the last remaining Hot ‘N Now is still serving up a lot of the same things they did in the 1990’s. Guess what? I went to Sturgis last week for work. I had some super jealous co-workers. The lone Hot ‘N Now sits in the same place it did when it opened in 1990 on a very busy stretch of M-66 on the south side of town. 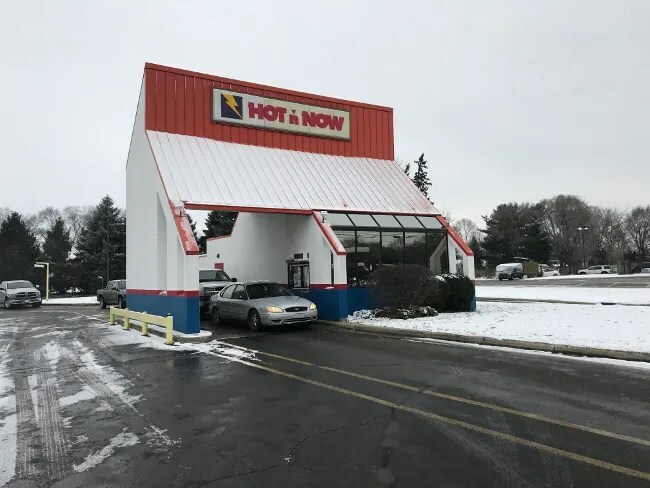 Like all Hot ‘N Now’s, the business is drive-thru only although it does have a few parking spaces off to the side where you can pull off and eat in your car. The building is set up with a drive thru lane that cars enter on the north side of the building. 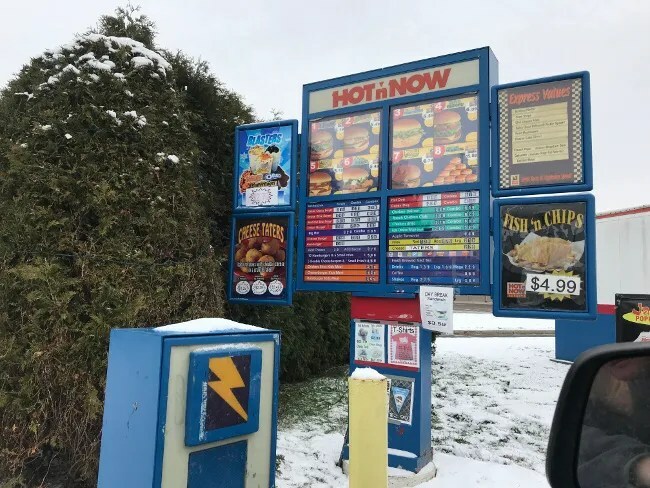 The long, narrow driveway leads to an old drive-thru speaker system with the menu on a lighted board behind a metal pole that contains the speaker. 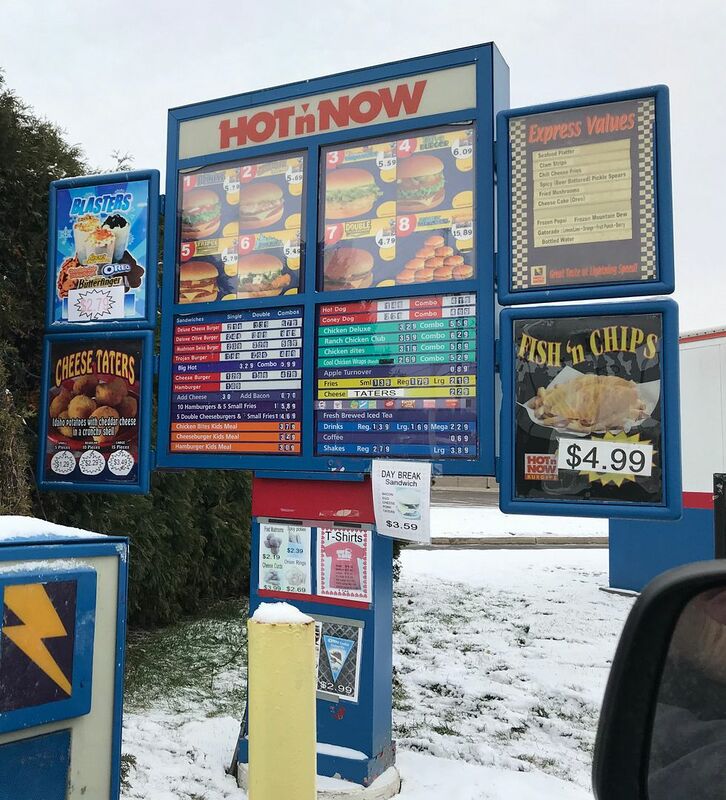 If Hot ‘N Now was still a thing everywhere, they probably would have upgraded to the new digital speaker boxes with monitors to show what you ordered but this place will likely always be stuck in the 1990’s. I quickly scanned the menu to find the typical fast food fare. They had value meals so I just went that way. Apparently, Hot ‘N Now’s big thing was the $.39 burger. That’s no longer a thing but the food is still pretty cheap. Once my order was placed, I pulled a head to the pick up window underneath the overhang where they had more advertisements for food. Not sure if you can order more there or if that’s for next time. I kept my order simple getting a #5 which is a Triple Burger, Fries and a Drink. I made it a large because I wanted that large drink. The total cost was just a little under seven and a half bucks. I grabbed the fries first and it was a good investment to upgrade to the large. The portion size of the thin fast food style fries is pretty large. 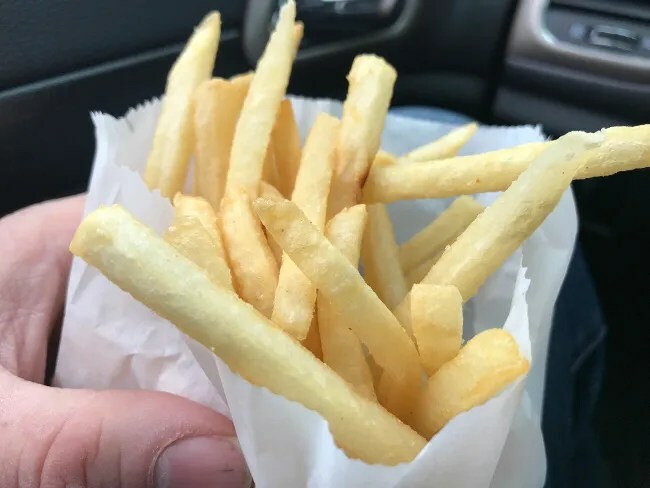 They’re the type of fries that could use some salt and a little mustard (I hate ketchup) but the portion size made up for the lack of any discernible flavor other than potato. The burger is pretty typical fast food. It was a Triple Burger but the patties are pretty thin and cooked to the point of dryness. There was a partially melted layer of cheese between the layers and it came on a not quite stale white bun. There’s probably supposed to be toppings on it but I asked for the burger plain which is how I prefer fast food burgers. 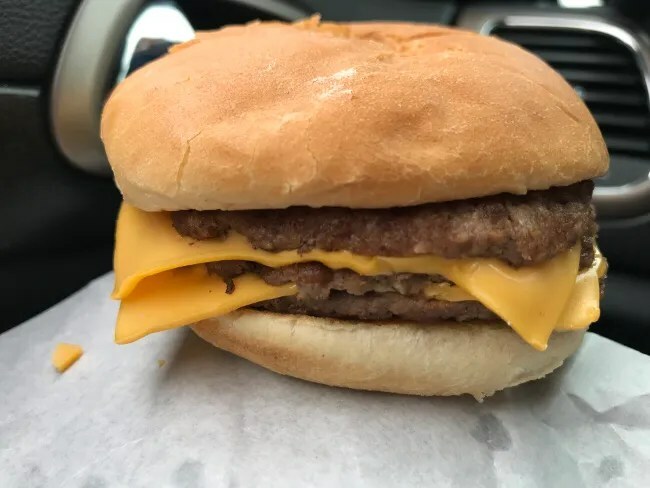 The patties are always a little bit salty which adds more than enough flavor for me. 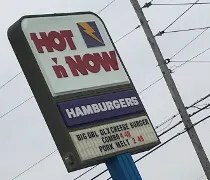 I have no nostalgic connection to Hot ‘N Now so I’m going to have a different impression of the place than those of you who grew up eating the burgers. I think it’s a find fast food burger and one I will go back to when I’m in Sturgis. There’s a lot of fun in getting things that don’t exist anywhere else and it’s hard to call Hot ‘N Now a chain anymore…so this is like eating from a local fast food restaurant. Is there any relationship of this burger chain to Checkers? Your takeaway is perfectly fair. The nostalgia comes from when you could go to a Hot n’ Now and get a bag full of cheeseburgers for so cheap (we’d literally pull out of the drive with a sack with like 20 cheeseburgers or something stupid and just go to town on them while driving back home. Think of how people approach late-night Taco Bell now, and that’s what Hot n Now used to be). The Olive Burger is also a really big deal still, as it was back then, and it’s probably their signature item (as it was back then). But that’s about it, the rest is pretty typical fast food stuff (they used to have really good chicken sandwiches too, but I haven’t had any of them since). That said… we eat at Hot n’ Now there whenever we’re in town, and no regrets. I usually get a Triple as part of what I have and they’re usually not dried-out, so you had some bad luck there I guess. The Triple is a good burger though. Hot n’ Now isn’t gourmet, but it’s still good. I don’t care for McDonald’s, and I find Hot n Now is a lot better than McD’s, and maybe about equal to say a Rally’s/Checker’s (and maybe also to Sonic). Maybe not quite on Wendy’s level, but it’s also not as expensive IMHO. But that’s ok.